The blasts in Baghdad’s Sadr City district also wounded 25 people, almost completely destroyed the mosque and damaged several nearby houses. People look for for missing victims after explosions in Sadr City, Baghdad, Iraq, Wednesday, June 6, 2018. Iraqi security officials say a pair of explosions has ripped through a mosque in a mostly Shiite district in Baghdad, killing and wounding civilians including two children. Baghdad: A pair of explosions ripped through a mosque in a mostly Shiite district of Iraq’s capital Wednesday, killing at least 10 worshippers, including two children, security officials said. 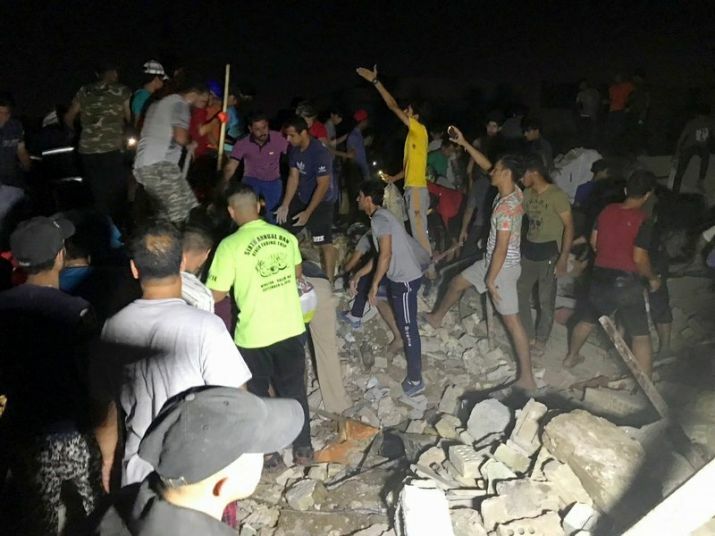 They said the blasts in Baghdad’s Sadr City district also wounded 25 people, almost completely destroyed the mosque and damaged several nearby houses. The officials agreed to give details of the attack only on condition of anonymity because they were not authorised to speak to the media. A government statement said the blasts occurred at a weapons depot in Sadr City. It said an investigation was underway to determine the cause of the explosions, but did not give the exact location of the depot. The officials said weapons were stored inside the mosque, which is frequented by supporters of Muqtada al-Sadr, a Shiite cleric whose supporters once fought American troops in Iraq in the years after the US-led invasion of Iraq in 2003. Al-Sadr’s followers won the largest number of seats in Iraq’s May 12 parliamentary elections but would have to form a coalition government with other blocs in a process that could drag on for months. Al-Sadr also commands a government-backed paramilitary force, which took part in the nearly three-year war against the Islamic State group, which had in 2013 and 2014 seized large swathes of Iraq’s territory. Iraq declared victory over IS last year, but the extremist group retains pockets in western and northern Iraq and continues to stage attacks on security forces.